Keratosis is the term describing a group of non-inflammatory diseases characterized by the thickening of the horny layer of the skin. There are various reasons that lead to relevant types of keratosis. The three most common types are follicular, actinic and seborrheic. There are many other types, most of which are rare or have a hereditary (genetic) in nature. The symptoms and treatment depend on specific type of the disease. I describe the main types of keratosis here. Follicular keratosis (Keratosis pilaris) is a common, harmless skin condition. It causes small, hard bumps in skin of light tones. They usually appear on the upper arms, thighs and buttocks, sometimes with redness or swelling. It can also appear on the face, but it happens much less frequently. Follicular keratosis is a result of accumulation of keratin, the protein that protects the skin from infections and other harmful substances. The accumulation forms a plug that blocks the opening of the hair follicle, but at the moment, experts do not know exactly what causes this process..
Actinic keratosis, also called solar keratosis, is a skin disease that develops due to prolonged exposure to the sun. It is the most common among pale-skinned, fair-haired, light-eyed people of 30-40 years old and becomes more common with age. Actinic keratosis appears as red, brown or flesh-colored spots that don’t disappear, ranging in size from 1 to 3 mm or more, having a rough texture. These spots are surrounded by red, irritated skin. They usually occur on the head, neck, or hands but can be found on other parts of the body. This kind of keratosis can mutate into one of the types of skin cancer. Seborrheic keratosis is a disease that causes the appearance of the benign growths on the skin. These growths are often confused with warts. However, the appearance of the latter caused by human papillomavirus, the cause of seborrheic keratosis is not known. Skin lesions in seborrheic keratosis are round or oval, flat or slightly elevated. The dimensional range is quite broad – from a few millimeters to 2.5 cm in diameter. The color can range from beige or light brown to black. Such growths can be found throughout the body, including the areas that were not exposed to the sun. Seborrheic keratosis is often found in the elderly. You can read about the main methods of treatment of keratosis below. It usually goes away by itself gradually. At the same time, you can use different cosmetic remedies to improve the appearance of affected skin. If moisturizers do not help, your doctor may prescribe medicated creams and ointments that help to remove dead cells. Such creams contain in its composition alpha hydroxyl acid, lactic acid, retinoid, which moisturize and soften dry skin. Regular use of medicated creams can improve the appearance of the skin. However, after the termination of the procedure, the symptoms often return. And even after treatment, follicular keratosis has the tendency to persist for many years. 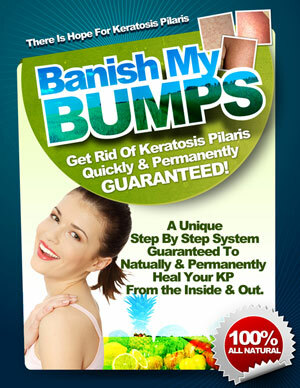 By the way, the book “Banish My Bumps – Get Rid Of Your Keratosis Pilaris” presents the unique and very effective treatment for follicular keratosis. Be sure to download it by clicking on the link at the bottom of the page!! The spots of actinic keratosis do not cause the patient any troubles often, in this case your doctor may recommend just monitor them and return to the treatment if new symptoms, such as rapid growth, bleeding or ulceration appear. However, actinic keratoses is often removed surgically for fear of turning it into skin cancer. There are a number of ways of removing tumors. Creams or gels. Pharmacology offers many creams and gels that can be applied on the spots. 5-fluorouracil cream, Imiquimod cream, Diclofenac gel are often used. Application of these creams and gels daily for several weeks causes the death of abnormal skin cells. In some cases it may be advisable to freeze keratosis with liquid nitrogen. This procedure usually leaves no scars, but big affected areas or early skin cancer may require more prolonged freezing that can permanently leave pale or dark marks on the skin. For full information about the treatment of keratosis at home, please, click the link below. I wish you good health. Thank you! !